Drive your own speedboat in Cancun! The tours shown on this page allow you to ride in or drive your own speedboat! If you thought there wasn't more to power watersports than renting a wave runner on the beach in Cancun, you thought wrong! These speedboats are fast, fun, and exciting. Some include an ATV tour, jet skiing or snorkeling too! FEEL THE THRILL OF YOUR OWN SPEED BOAT! 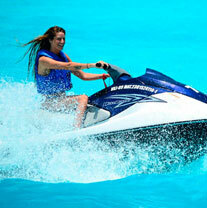 The choices you have of thrilling water activities in Cancun are vast - a speed boat ride is one of the most popular. These tours sell out well in advance, so make sure to book early if you want to drive your own speedboat in Cancun. Cancun Jungle Tour - Our price on this is the lowest you'll find in Cancun - guaranteed. It's located right in the hotel zone so it's very convenient. If you want to snorkel as well as drive a 2-person speed boat, this is the tour for you. 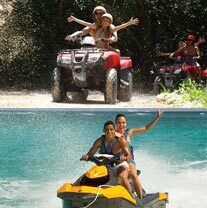 ATV & Speed Boat Adventure - This is a great way to spend a day - you get your adrenaline pumping with an ATV ride then head over to the speed boats to cool off. You can also add snorkeling to this excursion. Afterward, you can relax at a beautiful beach club for the rest of the day. This tour is also available from Playa del Carmen and the Riviera Maya. Add Snorkeling too if you like with our ATV, Speedboat & Snorkeling, or try this activity on Wave Runners instead of speedboats! 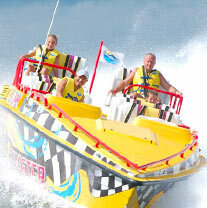 Extreme Jet Boat Adventure - This fast and furious jet boat ride is fun for the whole family. You don't have to drive, snorkel, or ride an ATV to take this tour. It's right in Cancun, so it's very convenient, and someone else does the driving, taking you through thrilling 360° cookies and getting you REALLY wet. A lot of fun. We offer lots of fun combo tours with this one too. Speedboat & Beach Break - Feel the excitement of driving your own speedboat through the clear waters of the Caribbean Sea aboard one of our high-speed extreme jet boat in Cancun. This tour will leave you wanting more! After the thrill of the ride, you can enjoy the rest your day in one of the most beautiful beaches in the world, white sandy beaches and the brightest sun will relax your day away in paradise! 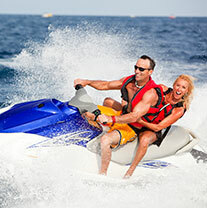 Wave Runner Rentals - Ride your own wave runner, and let it rip! You can rent these for a half hour or more if you like. Underwater Museum - The one and only underwater museum of Cancun. Ride a speedboat out to the statues, then snorkel on the museum!